The Cambodian market is poised for more rapid growth in 2013 after quietly expanding by 18% in 2012, making it one of the fastest growing markets in Asia. Flag carrier Cambodia Angkor Air is pursuing significant expansion albeit from a very small base while international carriers are also continuing to add services in the Cambodian market. The Mar-2013 suspension of service from Air France, which became in 2011 the first European carrier to serve Cambodia in decades, is a blow for the country’s emerging economy and tourism industry. But the loss of Air France is being offset by the addition of Qatar Airways, which will become in Feb-2013 the first Gulf carrier to serve Cambodia. Qatar could be followed by other Gulf carriers as well as more LCCs from the more traditional markets of Southeast and North Asia, which in recent years have been consistently building up their operations in Cambodia. 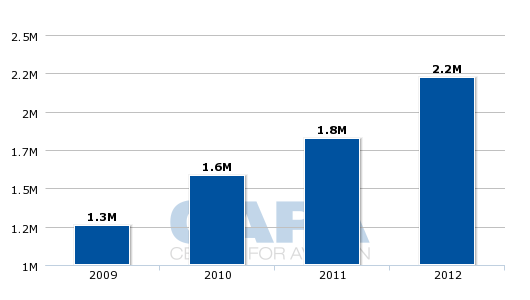 Just over 4.3 million passengers passed through Cambodia’s three airports in 2012, compared to just under 3.7 million passengers in 2011. The country’s two main airports – at the capital Phnom Penh and the tourist town of Siem Reap – both passed in late 2012 the two million passenger milestone for the first time. Siem Reap saw growth of 22% to 2.2 million passengers while Phnom Penh saw growth of 13% to 2.1 million passengers. The country’s third commercial airport, at the undeveloped beach resort of Sihanoukville, handled only about 20,000 passengers in 2012 and currently does not have any international services. Cambodia is predominately an international market with less than 150,000 domestic passengers in 2012 and about four million international passengers (including about 100,000 transit passengers). Both Siem Reap and Phnom Penh have seen steady and consistent traffic increases over the last four years but the growth recorded in 2012 was even faster. Siem Reap and Phnom Penh, both of which only passed the one million passenger milestone in 2005, have both now doubled their traffic in seven years. Low-cost carriers and the powerful Vietnam Airlines group, which includes Cambodian flag carrier Cambodia Angkor Air, have driven most of the recent growth in Cambodia. 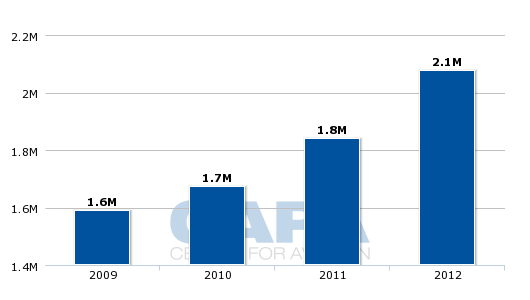 Vietnam Airlines is Cambodia’s largest foreign carrier, accounting for 18% of international capacity. It also has a 49% stake and management control in Cambodia Angkor Air, which currently has a 14% share of international capacity in its home market and a 17% share of system-wide capacity. 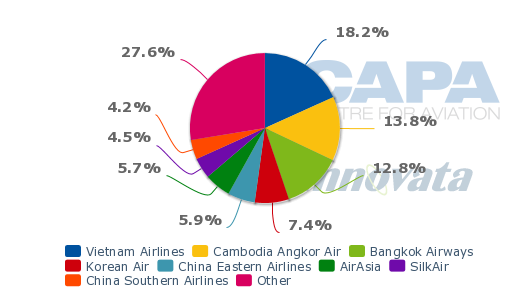 Vietnam Airlines is larger at Siem Reap, where it accounts for 27% of international capacity. Cambodia Angkor Air is larger at the capital Phnom Penh, where it is based and accounts for 16% of system-wide capacity and 11% of international capacity. Thailand’s Bangkok Air has a larger international operation than Cambodia Angkor Air or Vietnam Airlines in the more fragmented Phnom Penh market. Cambodia Angkor Air has a monopoly on Cambodia’s small domestic market which consists of only two routes – Siem Reap-Phnom Penh (about 125,000 passengers in 2012) and Siem Reap-Sihanoukville (less than 20,000 passengers in 2012). Vietnam Airlines, which sees Cambodia as an extended home market, has steadily expanded its Cambodian operation in recent years. 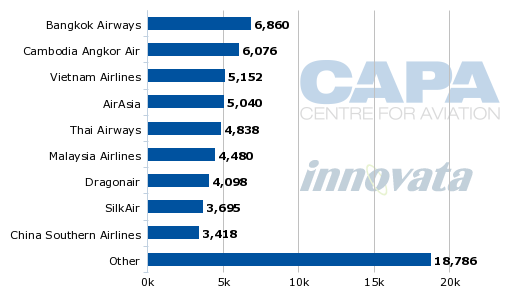 Over the last six months, the carrier’s capacity to and from Cambodia has grown by about 30% to just over 24,000 weekly seats, according to Innovata and CAPA data. In addition to serving three routes linking Vietnam with Cambodia, Vietnam Airlines operates daily service from Phnom Penh to Vientiane in Laos and from Siem Reap to Luang Prabang in Laos. Cambodia Angkor Air has doubled capacity in only the last three months to about 23,000 weekly seats (including about 5000 seats in the domestic market). The expansion included the launch of a daily flight at the end of Nov-2012 from Siem Reap to Bangkok and the launch of a daily service from Phnom Penh to Hanoi at the beginning of Jan-2013. The carrier also launched at the beginning of Jan-2013 a fourth daily frequency between Siem Reap and Ho Chi Minh, which is by far the largest of Cambodia Angkor Air’s seven routes with about 8600 weekly seats. The recent expansion in the Cambodia-Vietnam market was made possible by the delivery of an additional A321, which gives the carrier a fleet of three A321s and two ATR 72s. The additional A321 will also be used, starting on 01-Feb-2013, to launch a daily service from Phnom Penh to Bangkok, complementing the Siem Reap-Bangkok ATR 72 flight which was launched at the end of Nov-2012. Cambodia Angkor Air also added some domestic capacity on 16-Jan-2013, when it upgraded service on the Siem Reap-Phnom Penh route from 32 to 35 weekly frequencies. The carrier operates all its domestic services with ATR 72s. Its only other domestic route, Siem Reap-Sihanoukville, is currently only served three times per week. Cambodia Angkor Air launched services in 2009 as a joint venture between the Cambodian government and Vietnam Airlines. The two carriers have such a close relationship the two can essentially be viewed as one. Not only do the two carriers have a comprehensive codeshare arrangement, Vietnam Airlines has traditionally owned or leased all of the Cambodian carrier’s aircraft and have rotated the aircraft between the Vietnam Airlines and Cambodia Angkor Air networks. 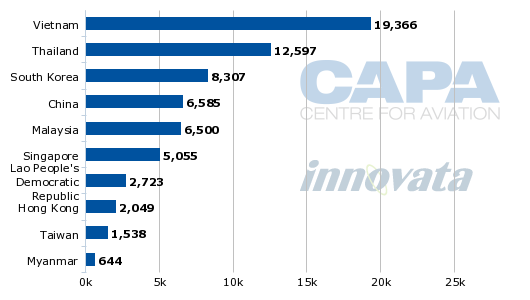 The two carriers combined dominate Cambodia’s largest international market, Vietnam. Vietnam Airlines currently offers about 10,000 weekly one-way seats to Cambodia while Cambodia Angkor Air offers about 8600 weekly seats to Vietnam, more than double what it offered just one month ago. Combined, the two carriers now operate 16 daily frequencies on the four routes connecting the two countries’ two main cities – Phnom Penh-Ho Chi Minh (two daily flights from Angkor Air and one from Vietnam Airlines); Phnom Penh-Hanoi (one daily flight from Angkor Air); Siem Reap-Ho Chi Minh (four daily flights from Angkor Air and two daily flights from Vietnam Airlines) and Siem Reap-Hanoi (five daily flights from Vietnam Airlines and one from Angkor Air). The growth on Siem Reap-Hanoi has been particularly phenomenal as the route was only launched by Vietnam Airlines in 2003. It is now the largest route from Cambodia and is the second largest route from Hanoi. Cambodia-Vietnam is a big local market for both tourists and business as the two countries have close ties. But a large portion of the traffic carried by Angkor Air and Vietnam Airlines to Ho Chi Minh and Hanoi are connecting to other destinations at Vietnam Airlines’ two hubs. Angkor Air and Vietnam Airlines are essentially interchangeable given their management ties, IT links and close codeshare arrangement. Air France currently operates three weekly Boeing 777 flights on a Paris-Ho Chi Minh-Phnom Penh-Ho Chi Minh-Paris routing. But the carrier is dropping the Ho Chi Minh-Phnom Penh leg at the end of Mar-2013 and pulling out of the Cambodian market entirely only two years after it entered. Air France initially launched service to Phnom Penh in Mar-2011 with three weekly flights to Bangkok and in 2012 switched the stopover to Ho Chi Minh. Losing Air France is a big blow to Cambodia as the French flag carrier was the only European carrier serving the country. Cambodia is a former French colony and maintains close ties with France. But Air France, which had gone 37 years without serving Cambodia, couldn’t make the service work – even thought the country’s largest carrier, Vietnam Airlines, is a SkyTeam partner. 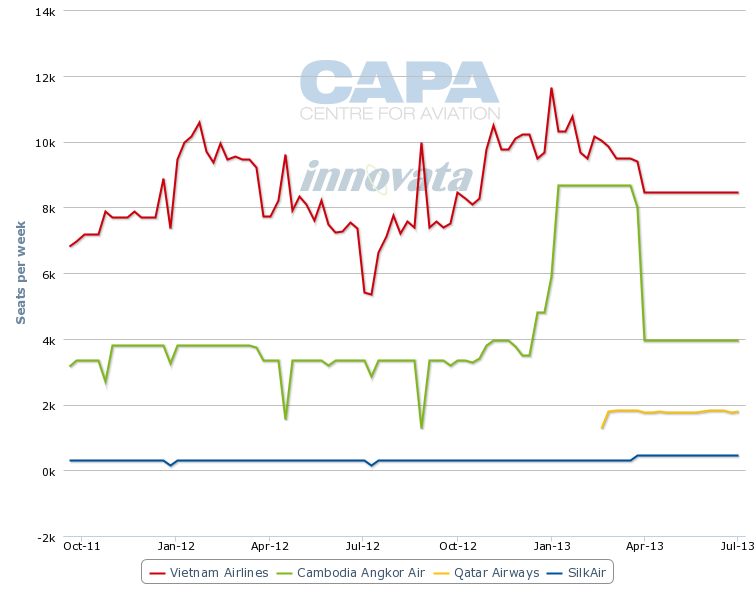 Qatar Airways, however, will more than offset the loss of Air France as it plans to launch on 20-Feb-2013 a daily service to Cambodia. The carrier will operate a Doha-Ho Chi Minh-Phnom Penh route using A330-200s. Unlike Air France, Qatar Airways will have local pick up rights which it gained as part of an air service agreement that was signed between Cambodia and Qatar in Nov-2012. The pick-up rights are critical in making the route viable and for the first time will provide competition on the Phnom Penh-Ho Chi Minh route for Cambodia Angkor Air and Vietnam Airlines. If successful the Qatar link could lead to other Gulf carriers launching service to Cambodia, similar to what occurred in neighbouring Vietnam – where Qatar became the first Gulf carrier in 2007 and was followed by Emirates in 2012. Particularly if local traffic rights to Ho Chi Minh or Bangkok are offered, other Gulf carriers such as Etihad or Emirates as well as Turkish Airlines could be enticed to test out the Cambodian market. As demand for services to Cambodia continues to expand, particularly for tourism, Qatar could look to serve Phnom Penh with a non-stop service from Doha. A non-stop service would significantly improve connections to Europe and give Qatar an advantage over other carriers serving the Cambodia-Europe market with a one-stop product such as Thai Airways, Malaysia Airlines, Vietnam Airlines and Singapore Airlines/SilkAir. Qatar as well as other major Gulf carriers and Turkish offer a huge network of destinations in Europe, as well as links to North America and Africa, which Asian carriers cannot match. With Cambodia unlikely to be able to support another European carrier following the withdrawal of Air France, Gulf carriers could become key to unlocking further growth at its airports and in its tourism sector. LCCs will also be an important driver for further growth in Cambodia’s market. LCCs have been expanding steadily in Cambodia in recent years from a relatively low base and this trend continued in 2012 with Singapore’s Tiger Airways launching services to Phnom Penh and the Philippine’s Cebu Pacific and South Korea’s T’way launching services to Siem Reap. Tiger and Cebu Pacific will likely add services to Siem Reap and Phnom Penh respectively, perhaps in 2013, as Asian carriers which enter the Cambodian market typically initially serve one destination and when pleased with load factors add a second destination. Both markets are similarly sized but have different dynamics. Siem Reap, a UNESCO heritage site which is famous for Angkor Wat and other famous historical temples, is almost entirely an inbound tourism market. As Cambodia’s largest city, Phnom Penh has a broader mix of traffic including inbound tourism, business and local Cambodian. Cambodia is now served by six LCCs. In addition to Tiger, Cebu Pacific and T’way, AirAsia Malaysia and Singapore-based Jetstar Asia serve both Siem Reap and Phnom Penh while Thai AirAsia serves Phnom Penh. Combined the six LCCs serving Cambodian now account for 14% of international seat capacity with the AirAsia Group accounting for 8%. AirAsia Malaysia, with two daily flights from Kuala Lumpur to Phnom Penh and one daily flight to Siem Reap, is by far the largest LCC serving Cambodia and is the fifth largest foreign carrier in the market. Thai AirAsia currently only operates one daily flight between Bangkok and Phnom Penh but has indicated it is looking to add a second flight during 2013. The AirAsia Group is well positioned to further expand in Cambodia as tourism, which accounts for the majority of traffic, continues to expand. With the Cambodian market unlikely to be large enough to support its own home-grown LCC, a group such as AirAsia, Jetstar and Tiger are well positioned to exploit the expected growth in travel as they are able to operate to Cambodia from many points using their various subsidiaries spread across Asia. 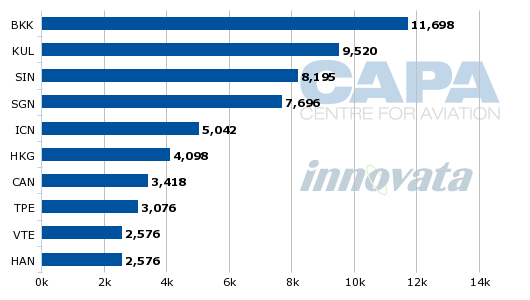 There are big opportunities for further LCC growth in Cambodia as the country’s 14% international LCC penetration rate is the second lowest among the 10 countries in ASEAN (only Laos has a lower international LCC penetration rate). As Cambodia remains a relatively poor and undeveloped country, most of the growth is being driven by the country’s continued emergence as a tourist destination. LCCs are well positioned to capture this growth, particularly the growth in the tourist arrivals from other Asian countries. 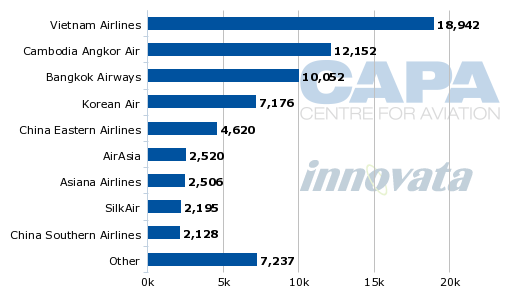 Given Cambodia’s lack of long-haul carriers, LCCs should also be able to capture some of the passenger traffic that originates in Europe or North America. Most of the tourists coming from outside Asia combine Cambodia with neighbouring Thailand or Vietnam, providing an opportunity for Asian LCCs to carry these tourists as they hop around the region. There are currently only LCC services from Cambodia to five countries – Malaysia, Philippines, Singapore, South Korea and Thailand. Vietnam, as Cambodia’s largest market, represents the biggest untapped opportunity for LCCs. This void could potentially be filled by Vietnamese LCCs Jetstar Pacific or VietJet. VietJet plans to launch its first international route, Ho Chi Minh-Bangkok, in Feb-2013 and is now looking at several additional international routes for 2013. Services to Siem Reap and/or Phnom Penh would be logical candidates for VietJet given they are among the largest international routes from Vietnam. Jetstar Pacific also currently only operates domestically but is now evaluating several international routes as it looks to launch international services in 2013. Phnom Penh and Siem Reap would be logical destinations for Jetstar Pacific as they are already served from Singapore by its sister carrier Jetstar Asia. But Vietnam Airlines, which now owns 70% of Jetstar Pacific, could be reluctant to let Jetstar Pacific serve Cambodia given the dominant position it now enjoys in the Vietnam-Cambodia market with its affiliate Cambodia Angkor Air. Hong Kong, which is Cambodia’s eighth largest market, is also a possibility following the mid-2013 launch of Jetstar Hong Kong. Cathay Pacific regional subsidiary Dragonair currently serves Phnom Penh from Hong Kong with 10 weekly flights. Phnom and Siem Reap could potentially support a LCC service from Hong Kong. In addition to T’way, Korean Air (KAL) and Asiana both serve Siem Reap-Seoul with KAL currently operating two daily flights on the route and Asiana one. Asiana and KAL both also operate a daily service between Phnom Penh and Seoul. KAL, which also operates a daily flight from Busan to Siem Reap, is now the third largest foreign carrier serving Cambodia. China, Cambodia’s fourth largest international market, also has LCC potential and Siem Reap and/or Phnom Penh could potentially be served by the largest Chinese LCC, Spring Airlines. 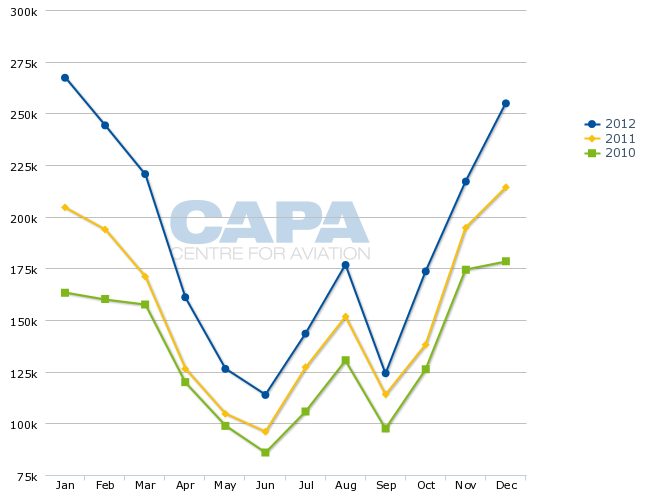 But at least for the short to medium term most of the growth in the Cambodia-China market will likely be driven by charter carriers as LCC growth in China is tightly controlled and limited. China over the last year has been one of the faster growing markets for Cambodia Airports, driven by the launch of several additional charter flights and capacity expansion at China Eastern, which now serves Siem Reap from four destinations in China and serves Phnom Penh from three destinations in China. China Eastern and China Southern, which only serves Siem Rep and Phnom Penh from Guangzhou, are currently the only two carriers operating scheduled flights to Cambodia. But, as is the case with the Cambodia-Korea market, there are several carriers operating charter flights between Cambodia and China including Cambodian charter carrier TonleSap Airlines – which operates a 737-300 and 757 to several points in greater China. 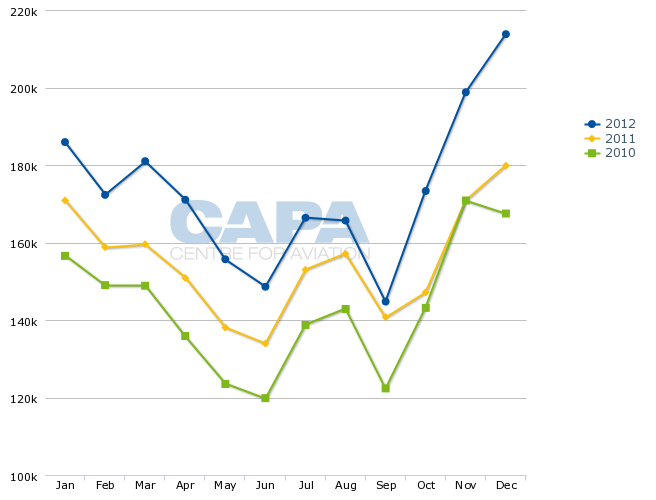 The Cambodia-Thailand market could also see significant LCC growth. While Thailand is Cambodia’s second largest market, the two countries have a rocky relationship and an ongoing border dispute. A more liberal bilateral – or an open skies agreement – along with political stability would open up huge opportunities. 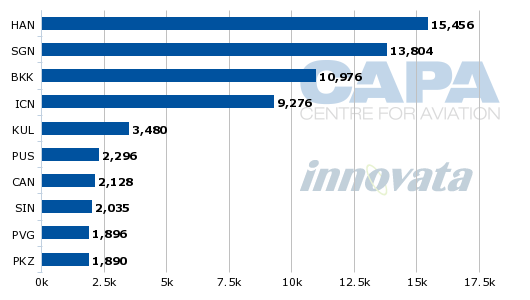 Bangkok is now the third largest route from Siem Rep (after Hanoi and Ho Chi Minh) with about 11,000 weekly seats. But unlike the larger Phnom Penh-Bangkok route, the market is currently not served by any LCCs. The Siem Reap-Bangkok route is large enough to potentially support Thai AirAsia as well as potentially a second LCC. For example, Siem Reap and Phnom Penh could be potential destinations for Nok Air, Thailand’s second largest LCC which plans to start operating scheduled international flights in 2013. Boutique full-service carrier Bangkok Airways now dominates the Siem Reap-Bangkok market with five daily flights while new entrant Cambodia Angkor Air only has one frequency. Bangkok Airways focuses on feeding several European and Gulf carriers which serve Bangkok. As LCCs focus more on local traffic and stimulating demand among Asian tourists, there should be room in the market for another type of carrier. Bangkok Airways and Thai AirAsia already co-exist in the Phnom Penh-Bangkok market. Bangkok Airways, which is currently the second largest foreign carrier in the country after Vietnam Airlines, operates four daily flights between Phnom Penh and Bangkok. Bangkok Airways has had a strong presence in Cambodia for several years and previously had a Cambodian affiliate, Siem Reap Airways. But political tensions between Cambodia and Vietnam made life difficult for Siem Reap Airways, which struggled to secure traffic rights and was shut in 2008, paving the way for Vietnam Airlines to establish Cambodia Angkor Air. Bangkok Airways has also expressed interest in serving Sihanoukville, which would benefit significantly with a link to Bangkok and fits well with Bangkok Airways’ niche of serving up-and-coming tourist destinations. But Cambodia-Thai politics make such a route challenging to pull off – at least for the time being. There is some hope that Thailand could be added during 2013 to the open skies agreement between the Mekong region countries of Myanmar, Vietnam, Cambodia and Laos. Under the agreement, carriers from any of these four countries are free to operate any international routes regardless of the carriers’ nationality. An extension of the agreement to Thailand would be huge for the Cambodian market and would lead to huge growth in the Cambodia-Thailand market as well as allow carriers such as Bangkok Airways to compete in the Cambodia-Laos and Cambodia-Vietnam markets. Cambodia would also benefit from competition in its domestic market. The lack of competition in Cambodia’s domestic market is a dampener to growth, particularly at Sihanoukville. The Siem Reap-Sihanoukville route has seen high load factors since launching a year ago but Cambodia Angkor Air has been reluctant to add capacity. The carrier has also been reluctant to launch international services from Sihanoukville, where a new airport opened in early 2007. As Vietnam Airlines controls Angkor Air, the reluctance to expand at Sihanoukville is seen by some as a move to favour Phu Quoc, a Vietnamese island near the Cambodia border that just opened a new international airport and has similar ambitions to become a major tourist destination. Cambodia Angkor Air’s monopoly on the domestic market has led to high fares and no growth since the carrier launched services in 2009. Cambodia’s domestic market has actually shrunk in size by about 15% since 2008, when there were about 170,000 domestic passengers. Cambodia’s domestic market could use competition, particularly as tourism in the country continues to grow and Cambodia is promoted as a destination in itself rather than packaged with Thailand or Vietnam as traditionally has been the case. For tourists to combine Cambodia’s famous temples at Angkor Wat with the unspoiled beaches Sihanoukville – instead of with the beaches of Thailand – domestic connectivity needs to improve. The huge potential of Sihanoukville, where projects are underway to improve the area’s limited tourism infrastructure including roads and hotels, cannot be untapped without more air services. Siem Reap has successfully emerged as a major tourism destination over the last decade as the infrastructure has been built and air services were successfully built up by Vinci subsidiary Cambodia Airports, which owns and manages all three of Cambodia’s airports. Siem Reap, which now has almost 20,000 hotel beds, had only about 500,000 annual passengers a decade ago. For Cambodia to grow tourism in the rest of the country, particularly its unspoiled coastal region, and keep tourists in the country for longer than just a few days, the domestic market and Sihanoukville market will need to be expanded. Competition and lower fares in Cambodia’s domestic market would also stimulate local demand. But the market may not be big enough to support a second local scheduled carrier as the failure of previous start-ups has shown. Cambodia's other carriers, including TonleSap and Sky Wings Asia, currently only operate charters and are not likely to be interested in acquiring smaller aircraft and entering the scheduled domestic market. Opening up the domestic market to foreign carriers, including LCCs, would be an attractive solution. 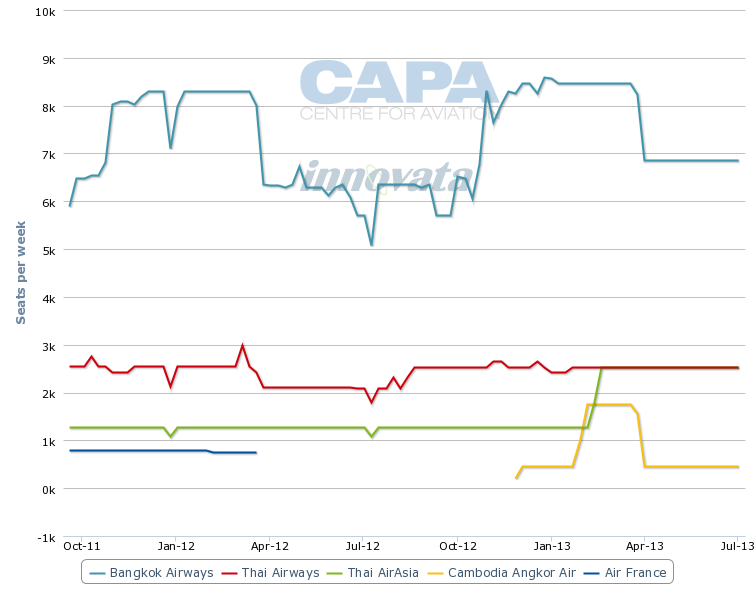 But Cambodian authorities have so far been reluctant to let foreign carriers enter the domestic market. Some foreign carriers such as Jetstar Asia and SilkAir already operate between Phnom Penh and Siem Reap as part of their international flights to Phnom Penh and Siem Reap but are unable to pick up domestic passengers. Cambodia, even with the recent high double-digit growth, still has a lot of untapped potential. With only about 140,000 weekly seats, Cambodia, along with Myanmar, is the most under-served market in Southeast Asia. Cambodia has a small population, about 14 million, and only a small fraction of Cambodians have sufficient discretionary income to afford flying. But the country’s economy is growing and, most importantly, its tourism industry has big growth potential. Siem Reap, which has already emerged as a popular tourist destination, is poised to grow further while the rest of the country is slowly being discovered. With such a dynamic, Cambodia’s aviation market is almost certain to continue growing at a rapid clip.